If you’ve made orzotto or risotto before you know you’re in for a treat. You also know that while it’s super easy to make you will be working over the stove for 35-40 minutes as you stir continuously. I found this recipe and was excited to try this one as my mom had just brought me fresh asparagus from her garden. If you have not had it straight from the ground, you have got to find you some to try. You can just break the stalk and begin eating! It’s wonderful. April and May are the best time to get your asparagus. And if you’re getting yours at the grocery store or local market you’ll be able to find a reasonable price during this short season. Heat a saucepan over medium-low heat. Add butter and oil. Add onions and cook 5-7 minutes, stirring occasionally. 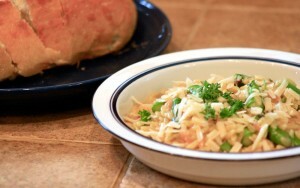 Add orzo; cook 2 minutes, stirring frequently. Stir in rind, juice, salt, and pepper. Add 1/2 cup stock to pasta mixture; cook 2 1/2 minutes or until liquid is nearly absorbed, stirring frequently. Reserve 1 cup stock. Add remaining stock, 1/2 cup at a time, stirring frequently until each portion of stock is absorbed before adding the next (about 13 minutes). Stir in remaining 1 cup stock and asparagus; cook 7 minutes or until asparagus is tender, stirring occasionally. Remove from heat; stir in half of cheese. Sprinkle with remaining cheese and parsley. Serve immediately.